We just had one nasty earthquake. Just from what I can gather in the way of information up to this point I'd say we may have some damage in a wide area, to include Fukushima Daiichi. Might just be minor damage, though. Still, we haven't had a shake that strong in a fair bit. Maybe not for a year or more. JMA's page for earthquakes is showing a 504 page right now, so I can't post anything from them, yet. I suppose posting here is better than starting a new thread. Could be this will be called an aftershock of 3/11 last year. A 7.3 magnitude at 10km deep. Not good, folks. Mother Nature at it again. And we do have a tsunami warning. Doesn't look like it'll be too high, but I'm not sure what the tide table is reading right now. We have a story here from the BBC and one thing I see is that in one area of Miyagi they simply moved back from the water's edge. Would have thought there was a need to actually try and find higher ground or a strong building where they could get a few meters off the ground. Jamie El-Banna, founder of It's Not Just Mud - a volunteer disaster relief organisation - said he joined the evacuation in Ishinomaki. He told the BBC: "We live less than a kilometre from the water so we went calmly as far back from the water as possible, which is what the advice is if you can't get to higher ground. Everyone evacuated in a calm, orderly way." Just above that piece is another individual reporting about a different area stated they moved to higher ground, as I thought all people would. Little bit confused about that "can't get to higher ground" bit. Like I wrote, what about strong buildings? Anyway, here's a link to the story. I don't think anyone in this area of Japan is too surprised we've had a good jolt in this area because we've had quite an uptick in the past few weeks in seimic activity from the Tohoku area down to Koshin and this one was the latest. I suppose the experts will state this is just another aftershock from Mother Nature's gift to us on March 11th, 2011 but I am not so sure if I trust those experts anymore. And I have done a compilation so you can get an idea of how this would have affected Fukushima Daiichi — a good, strong 3 on the Japanese scale. 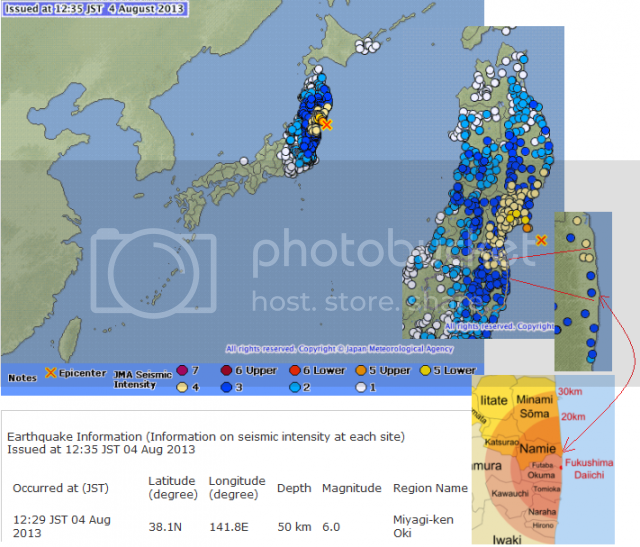 Note to Mother Nature - please give Japan a break, they need a long break from the shakes. Wednesday, September 14, 2016, 3:59 PM -	New research may help predict when there's a heightened risk for deadly earthquakes, scientists say. A recent study published in the peer-reviewed journal Nature Geoscience finds that the same forces that create high tides also have a role in setting off significant quakes, Phys.org reports. When the sun and moon align we can see extra-high tides. According to researchers that contributed to the study, bigger earthquakes are more likely during these periods of "high tidal stress." When gravity's pull is the strongest, "the probability of a tiny rock failure expanding to a gigantic rupture increases." Over the past twenty years, University of Tokyo's Satoshi Ide and his colleagues examined the world's largest quakes (those reaching magnitude 5.5 or higher.) Ide and his team found no specific correlation between "tidal stress" (the measure of gravitational pull) and smaller quakes, Phys.org reports. But many of earth's largest quakes took place when the tug of the sun and the moon were especially powerful -- namely, the devastating 2004 earthquake in Sumatra, which claimed 220,000 lives as it unleashed a powerful tsunami toward southeast Asia. The same can be said for Japan's 9.0 magnitude tremor in 2011, which killed roughly 19,000 near the Fukushima nuclear power plant. The science behind earthquake triggers and evolution is still widely unknown, but according to Ide, these discoveries "can be used to improve probabilistic earthquake forecasting, especially for extremely large earthquakes," Phys.org notes.